Despite tough weather conditions, the Spirit fleet sailed their way to victory at this year’s British Classic Yacht Club Panerai regatta. With their classic looks and modern build techniques and appendages, all Spirit yachts are eligible for the Spirit of Tradition class in classic regattas worldwide. Whilst several Spirit owners delight in day sailing or blue water cruising in their Spirits, many also enjoy thrill and exhilaration of the ever competitive classic regatta circuit. Historically, with their light displacement and impressive strength to weight ratio, Spirit yachts have always enjoyed notable success on the classic yacht racing scene. 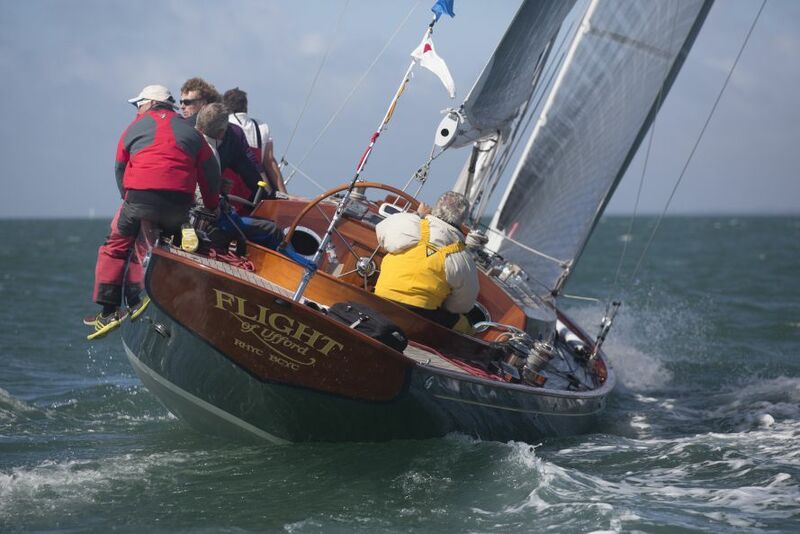 This year it was Spirit CEO and head designer Sean McMillan’s Spirit 52’ Flight of Ufford which stood out from the fleet. At this year’s British Classic Yacht Club’s 13th annual Panerai regatta, and following a refit earlier in the year, nine year old Flight placed first in the Class 1 Modern Classics and won the ‘Je ne sais quoi’ award (for a stunning yacht with an all-round friendly, approachable and helpful crew). Sean and crew did not however have an easy run to the top spot, with fantastic performances from Spirit yachts across the fleet in Class 1 Modern Classics. Spirits Soufrière, Chloe Racing Spirit and Helen placed second, third and fourth respectively. Spirit 52’ Soufrière also won the Sea Dragon award for line honours in the Round the Island race with Spirit 52’ Chloe Racing Spirit winning on corrected time. After over eight hours racing in the Round the Island, it’s remarkable to note just how close the final finish times were with Flight less than 2 minutes behind winner Chloe, Soufrière just over 2 minutes behind Flight, and Spirit 37’ Phantom just seconds behind Soufrière. Meaning after over eight hours of racing in over 30knots the first four boats, all Spirit yachts, were within 5 minutes of each other. Keep updated on all the latest regatta news and images on our Facebook and Twitter pages.